If we didn’t know darkness, we couldn’t fully appreciate the light. Garth Black’s more familiar with this concept than most people are. He hadn’t just lived in the dark for the majority of his life—he thrived in it. With a mom who’d bailed on him and a dad whose understanding of coddling started and ended with a bottle of whiskey, Garth had never been expected to rise to any sort of occasion other than following down the same dead-end paths. That changed when he fell in love with Josie Gibson. After years of pulling each other closer before shoving the other way, they finally stopped shoving. Josie’s love is like nothing Garth’s ever experienced. He holds it close. He holds it sacred. He would do anything to preserve it and keep it from pollution, even if that means removing himself from the picture. Garth might have been allowed a temporary furlough to bask in the light, but that pass has been revoked, and he’s been swallowed again by the dark. Will he revert to his old ways of hurting those he cares for most? Will he go back to the same destructive patterns . . . or will it be worse this time? We can’t know light without first knowing dark . . . and Garth Black’s about to get acquainted with the dark in a whole new way. The Lost & Found Series is beautiful. The characters are real and relatable, and the plot themes are fun, but also have substance. These books are one of my all-time favorite romantic series'. I cannot get enough of Rowan, Jesse, Garth, and Josie. These characters hold a special place in my heart, and I fear my words cannot possibly do this series justice. In Losers Weepers, we get the continuation of Garth and Josies's love story, told exclusively from Garth's point of view. Things are going well for Garth and Josie. They are extremely happy and deeply in love with one another. Garth is ready to ask Josie to be his wife, but first he needs to get on the bull, and qualify for nationals. He stays on the bull for 8 seconds like he needs to, but then he gets distracted and catapulted off. When Garth wakes up in the hospital, he cannot feel or move his body anywhere beneath his neck. The doctor tells him that he has a ten percent chance of walking again, and this destroys him. He realizes that he cannot give Josie the kind of life that he feels she deserves. He doesn't feel useful or like a man anymore, and is determined to push the only woman he's ever loved away. Will Josie leave, due to Garth's snarky attitude, and determination for her to move on? Or, will she be successful in proving to him that real love means sticking together in the most dark, difficult, and devestating of times? Losers Weepers broke my heat. I felt such deep and raw emotions as I read Garth's story. I related to how he felt useless, pitied, and unworthy of Josie's love. I couldn't walk and was bed ridden for five months. This story brought me back to that time in my life. A time where I felt like I was a prisoner in my own body, and people had to bathe me, feed me, and do the simple things that we all take for granted. Wow... Garth's story hit home for me. It was powerful, emotional, and real. I love Garth's character. He was selfless, and was trying to do the right thing by sacrificing his happiness for the woman that he loved. He was in a dark place, and his depression, bitterness, and hopelessness shined through with his self deprecating humor, and sarcasm. Josie was a bright light. She was strong, and persevered to show Garth that she truly loved him, and nobody could take his place. She was in their relationship for the long haul. I respected hoe Josie could be tender, nurturing, and hopeful at times, but wasn't afraid to use tough love and put Garth in his place, when he needed it. Rowan and Jesse made an excellent supporting cast. Rowan is still full of fire and determination, while Jesse's still sensitive, compassionate, and loyal. 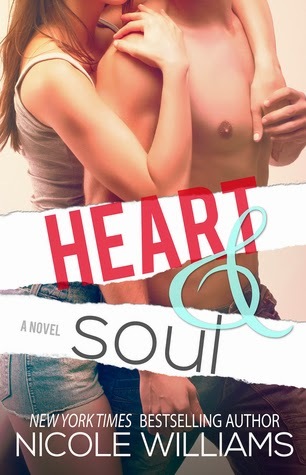 They had a secondary storyline, that sets up the next story in the series, Heart & Soul. I am highly anticipating their next story, because I have loved every single book in this series. 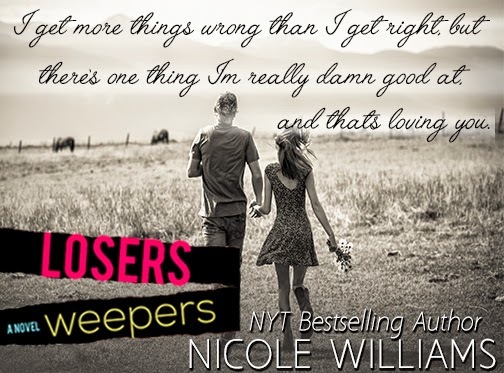 I give, Losers Weepers, by Nicole Williams, 4 Heatbreaking, Raw, Unconditional Love Filled Stars! Romance readers, please try out The Lost & Found Series. It is a series that will appeal to a large audience, and I think everyone will love!